CHICAGO (WLS) -- "Hamilton" continues to be one of the most popular Broadway musicals in Chicago. For those who haven't seen it yet, now is their chance! More tickets will go on sale Tuesday for "Hamilton: An American Musical" at the Privatebank Theatre in the Loop. The show's producers announced Aug. 23 a new 16-week block for the show. Tickets will be available for performances through April 29, 2018. 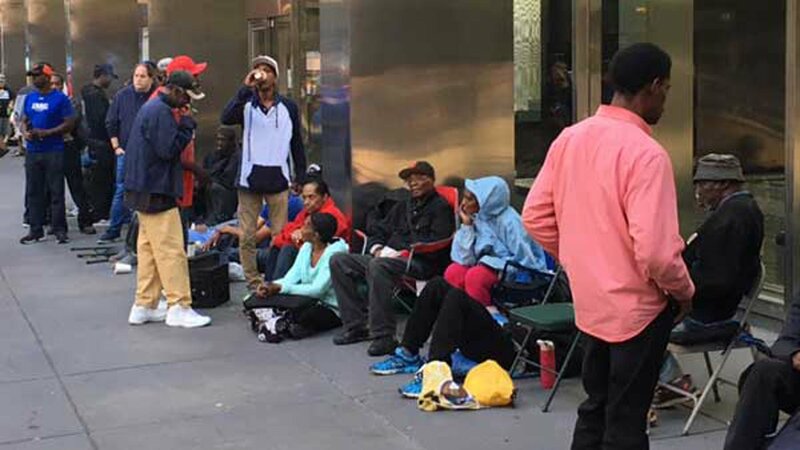 Tickets were scheduled to go on sale at 10 a.m. on Aug. 29, and many people got in line early. They can be purchased online at www.BroadwayInChicago.com, over the phone via the Broadway in Chicago ticket line (800-775-2000) and at the Privatebank Theatre box office, which will be open from 10 a.m. - 5 p.m. There is a limit of 12 tickets per household for performances between Jan. 9 and April 29. Tickets will cost $65-$190 for regular shows, with a select number of premium seats available. Producers said lottery seat locations will be different for each performance, but will always include first-row seats. For more information about the lottery, click here or download the Hamilton app. "Hamilton" was written by Lin-Manuel Miranda and tells the story of one of America's founding fathers, Alexander Hamilton, using contemporary forms of music.